SimpleLogic Gates is a mod which adds redstone gates, inspired by the designs found in RedPower 2 and its spiritual successors, in particular RedLogic. Shift-scrolling lets you switch between the gates you have in your inventory without opening the inventory menu! You can invert any input or output of a gate by putting or removing a redstone torch on it. As of 0.5.0.248a, it plays well with Redstone Paste! Works best with SimpleLogic Wires! Also works well with Redstone Paste. If you're doing complex circuits, you may find Charset Tools's Signal Meter and Stopwatch really handy! Certain gates (such as the Multiplexer, Synchronizer and Pulse Former) cooperate with analog I/O. Randomizers will not generate random values continuously - you have to cycle them externally. 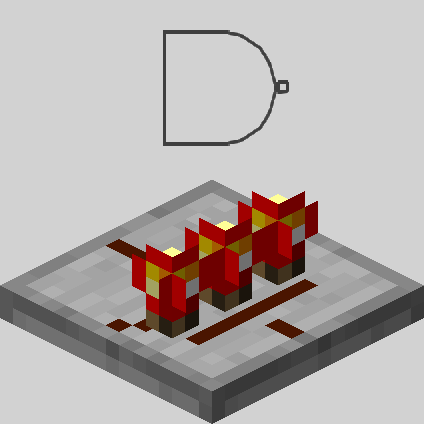 Randomizers, upon receiving a weak redstone signal, will generate random analog values as opposed to digital ones. Set-Reset Latches are actually JK latches - the difference is that triggering both inputs at once will cause the value to toggle, instead of unpredictable behaviour. Some gates are missing - in no small part the Timer! The codebase is a bit rough. Needs work. For those of you familiar with the 1.9/1.10 releases of Charset, the gates in this mod are a direct descendant of those. I have absolutely no idea what half of these are supposed to be used for, but they seem to be working perfectly. This is awesome! Thank you! You need to use SimpleLogic Wires. I don't think any other redstone mods use Charset's bundled redstone API at this time. Charset Tools includes a Signal Meter! Use it to debug bundled wire contents. The Bundled Inverter takes one of the sides as input, and one of the sides as output - I think the one with a dark gray line on it is the output side. The Bundled Transposer has a GUI. You connect individual bundled cable lanes in it, and the in-world representation should match what happens to the signal. Hopefully this will help guide you in the right direction. Thank you, this was very helpful. I've figured out how all of them work now except for the transceiver. The Bundled Transposer is actually SO useful, I'm really glad I asked about it. I've been experimenting with the various gates, maybe I could help out and add some detailed wiki pages for them. I'm really enjoying using this mod. Thanks so much for your great work. Oh, I confused the Transceiver with the Transposer. I was barely awake. The Transceiver effectively acts as a diode - give it a redstone signal on one side to enable bundled signals to travel in one of the directions. The arrow which lights up will signify the enabled input->output direction. oh cool, that is starting to make sense now. In my experimenting I was able to figure out that you can connect bundled cables to the top/bottom, and normal wires on the sides, but couldn't figure out anything beyond that. so just to clarify (sorry, my background isn't in electronics / circuitry! ), depending on which side you apply a signal to, it will send the bundled signals in a particular direction. I'm guessing if both sides have signals applied, the bundled signals travel in both directions? I'm guessing if both sides have signals applied, the bundled signals travel in both directions? Alternatively, every release of CharsetLib contains a changelog for all dependents, including SimpleLogic gates. Any news when this will work well with RS wires? Also some new gates and logic maybe? Awesome mod so far ! I am on modding hiatus until mid-August, so probably few changes will happen until then. Just a small thing I wanted to say - I reaaally miss the state cell from project red. That would be the best one-block redstone mechanism to add imo whenever u decide to add some more things to this mod. SimpleLogic Wires has been released which should fulfill the need for wires. No information on RSWires compatibility, however. Just great, I can't wait until RSWires mesh well with this mod as I have dearly missed RedPower 2 and Project Red, they are a great help when automating redstone. I seem to be having a weird issue, I added the mods to the folder and started the game, game loaded just fine but when I go to look up the mod in JEI, nothing shows up. Try looking under the "charset" mod ID, as SimpleLogic is internally a Charset module. Also, CharsetLib is required, or the mod won't work. Okay, so I looked up what you said, it shows two items, one item is the letter A and does nothing, can't place it etc, the other says its a wire but no texture (logo), when selecting the wire, it crashed my game.